Experimentally, we incorporated the NUPACK calculations from the computational team into an actual laboratory protocol. To start, we created the DNA tile by annealing DNA tile halves separately and then formed the full tile by mixing the two assembled halves together at room temperature. Next, we made the Ets-1 protein by means of overexpression in E. coli and chromatography purification. From there, we co-crystalized the Ets-1 protein with the full DNA tile for X-ray diffraction analysis. Below, we outline the experimental work for both pieces of the co-crystal: a DNA tile and DNA binding protein. Each tile design is composed of two portions, we call tile halves. In the design we pursued (picture below), each tile half consists of four strands DNA. For co-crystallization, we need ultra-pure starting materials, including the DNA tile. Therefore, we ordered purified DNA from IDT DNA, a DNA synthesis company. Specifically, the DNA oligomers were purified via Reverse Phase-High Performance Liquid Chromatography (RP-HPLC). To build a complete tile, each tile half was constructed first: Tile Half 1 consists of strands A, B, C and D while Tile Half 2 consists of strands E, F, G and H. These strands are combined in the correct 1:1 ratio to make a tile half without any excess DNA. Lingering DNA can potentially interfere with downstream applications. The annealing step involves mixing individual strands of DNA in a 1:1 ratio, ramping up the heat to separate all the hairpins or unwanted DNA interactions, then slowly cooling to anneal the pieces together. After creating each tile half, we analyzed the successful annealing of each tile by Native Polyacrylamide Gel Electrophoresis (PAGE). Electrophoresis separates macromolecules by size. We chose to use NativePAGE to prevent the annealed tile halves from separating in the analysis. 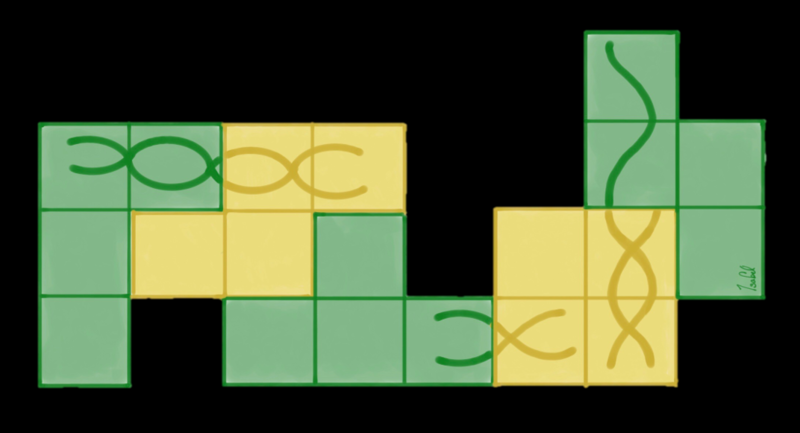 The CSU BIOMOD computational team theorized that each tile half is capable of binding to its respective half at room temperature. As a result, each tile half was combined at an equal ratio and allowed to sit for 12 hours minimum. Unlike the relatively inexpensive DNA synthesis, protein is expensive commercially. Instead, we make Ets-1, the protein that binds to our DNA tile, in-house. Molecular cloning is the method of which scientists introduce the gene for protein production into E. coli. A very common method of cloning uses restriction enzymes. Restriction enzymes were first discovered by Ronald W. Davis from Stanford. The basic mechanism is shown in the image below. The complete plasmid will be transformed into E. coli via heat shock. The E. coli without the plasmid does not grow. We use a modified version of sequence and ligation independent cloning (SLIC). We call this LICKI…(for you Pokemon fans, this is named after Lickitung). The LICKI protocol was created and developed by Dr. Thaddaus Huber, alumnus of the Snow Lab. The annealing step brings sequence complimentary strands together. After annealing, there are four products gene products. With the plasmid completed with the gene for Ets-1, we transform the plasmid into E. coli via heat shock. To confirm we have the correct plasmid constructed, we send our plasmids to be sequenced. We use Benchling, a Molecular Biology workflow software, to align the sequencing results. Once we have verified that our plasmid sequence is correct, we are ready for expression of the protein. There are many ways to over-express a protein but we use the strong T7 promoter system. The schematic below is a simplified version of the induction process. We over express Ets-1 in BL21(DE3) E. coli, at 25°C, 250 rpm, after induction with 1 mM IPTG. Outgrowth is for 16 hours. In order to crystallize, we need the protein ultra-pure. We use a series of chromatography purification steps to separate Ets-1 from the native proteins in E. coli. First, we sonicate the cells. In this process, the cell walls are broken to release Ets-1 into the lysis buffer. Once the protein is in solution, we run the protein through Nickel Affinity and Cation Exchange Chromatography. The image below gives the major scheme of Nickel Affinity Chromatography. In order to achieve a crystalline structure, we must combine the protein and matching DNA to form a Protein-DNA Complex. This process involves finding the best ratio of protein to DNA to add together and incubating the mix. We add the protein at an 8:1 protein to DNA tile ratio. With the DNA tile bound by the protein, we can now set up crystallization trials. We use a system called screening to find the best conditions for crystal growth. The crystal plates that we screen with use a method called Sitting-Drop Vapor Diffusion crystallization. For a thorough explanation of this process, please visit Hampton Research. Basically, the solution is very concentrated in the top well and it wants to be in equilibrium with the giant puddle of solution in the reservoir. The water will slowly diffuse into the drop in the well until there is equilibrium between the solutions. At various points in this equilibrium process, the protein-DNA complexes in solution will order into a crystalline structure like the one shown below. There are many factors you must consider. Some include, the salt concentration, the pH, and the drop to reservoir ratio. After sufficient sized and quality crystals are grown, we will shoot the crystals with X-rays to give a diffraction pattern. Through interpretation, the diffraction will give us atomic level detail of our host crystal. An example of the resulting pattern given from X-ray diffraction. To achieve crystallization, we need the tile highly concentrated and pure. We resuspended the single stranded tile strands in a buffer with magnesium chloride and salt, to help balance the negatively charged DNA backbone. The stock DNA solutions for strands A-F were created such that each DNA solution was a concentration of 100mM. To save material, we optimized tile half assembly with diluted samples of the strands. As mentioned in the methods, we first assembled the tile halves (Half 1: A-D; Half 2: E-H). The tile halves were annealed separately on a Thermocycler and analyzed on NativePAGE for successful annealing. Below, we show some pictures of NativePAGE gels during the troubleshooting period. The goal of each gel is outlined in the bottom left. From the results we found that most of the strands came together to form tile halves. To purify the halves and to get rid of any remaining A-F strands we planned on doing gel extraction of the tile halves bands occurring around 100 BP due to the tile halve complex being formed with around 130 nucleotides. Agarose gel was chosen due to its low cost and its ability to handle large sample sizes. The two tile halves were mixed at equimolar ratio to achieve the full tile. After combining the tile halves to form the full tile, we co-crystallized with the Ets-1 protein. See the images below for our crystal successes! Although the crystals are not large enough for diffraction we still were able to produce crystals without additional purification of the full tile. This shows us that the tile design given by the computational team was well designed in that it prevented unwanted DNA binding interactions. There is still much further research to be done but we have a very promising preliminary result that shows the first modified DNA tile protein complex forming a porous crystal. At the moment, we do not have large enough crystals for X-ray diffraction. We will continue to screen for better crystallization conditions, but we believe small crystals may be due to the purity of the DNA tiles. As you read in our methods section, we pursued co-crystallization with the full DNA tile, which may have contained left over strands in solution. We hypothesize that we can obtain larger and better quality co-crystals when the full DNA tile is purified. Having successfully crystallized the design opens an opportunity for further downstream experimentation. Higher quality crystals will be grown using purified full DNA tiles. Also, crystallization buffer conditions will be further optimized to promote larger crystals. Having higher quality crystals will make future applications ideal. One future application is molecular guest capture, highlighted in our team video. Specifically, molecules with unknown structure can join the crystal through large solvent channels and be analyzed with X-ray diffraction. Any molecule that can bind specifically to DNA can short-cut the traditional crystallization process and join the host crystal structure.